Let us now praise Kevin Costner. A long time ago, in a galaxy, far, far, away—actually the late 1980’s and early-to-mid ‘90s, long before many of you fanboys and girls were even hatched—Costner was one of Hollywood’s biggest stars. And he achieved that enviable feat without appearing in a single Marvel Comic Book movie (I know, perish the thought) or franchise/tentpole picture. Costner became a star by—are you sitting down, kiddies?—headlining a series of intelligent films made expressly for grown-up audiences. THE UNTOUCHABLES, NO WAY OUT, BULL DURHAM, FIELD OF DREAMS, DANCES WITH WOLVES, JFK, TIN CUP, et al. Pretty groovy, or at least pretty retro, huh? After sitting a good chunk of the past decade out (he must have figured there was no place for him in an industry where Marvel and D.C. reigns supreme, and the medium-budgeted adult drama that used to be his bread and butter had become an endangered species), Costner is in the midst of a most welcome mini-renaissance. He starred in a string of mostly solid efforts last year (JACK RYAN: SHADOW RECRUIT, 3 DAYS TO KILL, and the terrific, albeit underperforming DRAFT DAY), and has now reunited with writer-director Mike Binder who helmed 2005’s THE UPSIDE OF ANGER, which gave him his last indisputably great screen role. Binder’s BLACK OR WHITE isn’t remotely in the same league (for starters, it lacks a great female lead like ANGER’s Joan Allen), but it proves Costner can still hit it out of the park if given half the chance. Tinseltown, please take note. 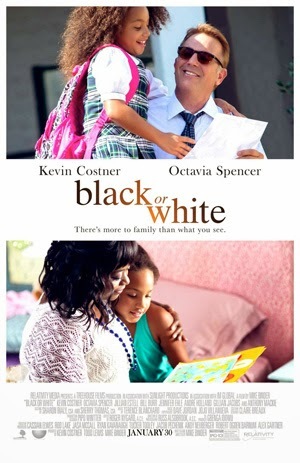 Costner plays Elliot Anderson, a successful Los Angeles attorney who’s been raising his biracial granddaughter, Eloise (charming newcomer Jillian Estell), after his daughter died in childbirth. When Elliot’s wife (the always welcome Jennifer Ehle) is killed in a car accident, Eloise’s paternal grandmother, Rowena (Oscar winner Octavia Spencer), sues for custody with the help of her lawyer brother (Anthony Mackie from THE HURT LOCKER). Because Elliot finds even the notion of joint custody untenable (he’s desperately afraid of losing his only connection to his late daughter and wife), he’s suddenly put in the precarious position of proving his mettle as the child’s sole guardian. The fact that he’s been hitting the bottle since his wife’s death doesn’t help his cause. Of course, making Eloise’s biological dad (Andre Holland) an ex-con seemingly incapable of getting his act together helps tip the scales in Elliot’s favor. But to the film’s credit, it makes a legitimate case for the child growing up—at least part of the time—among relatives who happen to share the same skin color. Binder wants to have his cake and eat it, too. Even though he brings up uncomfortable discussions of race (Costner has a fantastically brave monologue in which his true feelings about certain African-Americans—namely Eloise’s no-account dad—come to the surface), he’s too quick to wrap things up on a not entirely convincing “can’t-we-all-just-get-along” note. Another issue I had with the film was its total and complete waste of the wonderful Ehle whose “role” consists of maybe a half-dozen (silent) flashbacks. No fair. Fortunately, everyone here does strong work (Holland, Mackie and Spencer in particular), with Costner its undisputed ace in the hole. He brings such gravitas and bone-weary sadness to Elliot that you can’t help but pull for him, even when he’s behaving badly. Which, quite frankly, is a good deal of the time. Costner makes you feel the wrenching sorrow Elliot confronts on a daily basis after losing both his wife and daughter in such cruel and seemingly arbitrary ways. It’s another splendidly lived-in Costner performance (few actors have ever seemed as comfortable in their own skin). I hope we continue to see a lot more of him in the future. 3 out of 4 stars.